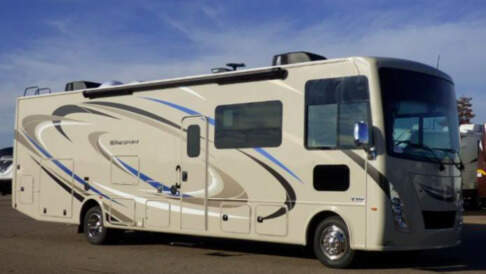 The RV is the latest 2018 Thor Windsport 34J Bunkhouse model with one superslide, an outdoor kitchen area, 5 televisions, gas grill outlet, and sink. The unit is new - It is always kept very clean and mechanically sound. It is 36' in length and can sleep 10 people (2 on the king bed, 2 dining, 2 sofa, 2 in bunk beds and 2 on the overhead bunk- 500LB limit). There is plenty of storage inside and boasts large closet spaces. Pets and smoking inside the RV is not allowed. Towing other vehicles or trailers is also not allowed. We understand the need to have power running during your travels, so we allow unlimited use of the generator to power the outlets, charge your devices, and most importantly for the TV and overhead A/C turned on. Insurance through the website is a requirement in order to authorize your rental request. An insurance binder from your personal insurance alone is not acceptable to cover damages to the coach. . Thank you very much for your consideration and for your interest in our RV. This is the perfect combination of motorhome and Toy Hauler. The garage will surprise you will all of the ways you can and will use it like: private bedroom with seperate entrance, patio with rockin stereo and tv and two comfy couches, it even fits a two seat rzr or whatever side by side you have ( or you could rent our 4 seat golf cart as well). It is very spacious, has a touch screen remote to help get camp set up, has every option you can think of and drives like a dream. It has a bunk that comes down over the drivers area that will sleep two, the couch will also pull out and sleep two, the table make into a bed that would sleep two kids, and the garage has two couches that make into beds or you could put a king size air mattress back there. 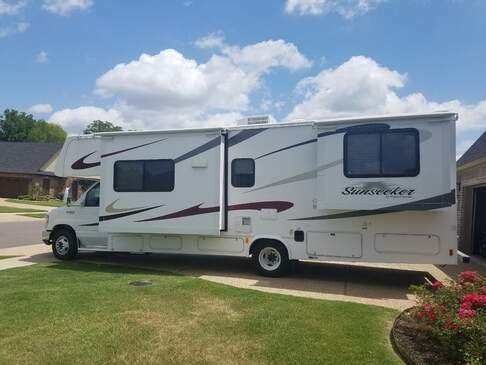 You cant go wrong with this RV, it is emaculate, i am a master mechanic so i keep everything in tip top shape, its fully stocked with all the essentials, and some non-essentials like: PS3, Ladder ball, Washers, and some board games. She ain't no Prius so she like to drink her fair share of the gasoline, averages about 8 but what she lacks in mileage she makes up for in all her side storage and towing ability ( up to 8k pounds). Brand new 2018 Forrest River Vibe 313BHS travel trailer. 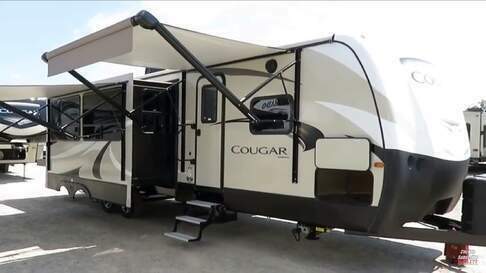 This coach is great for a family get away or a hunting excursion. The spacious camper features 3 slide outs, one in the living/dining room with the second directly across in the kitchen, making the living space very open. The third slide is in the bunkhouse. The unit has an island in the kitchen which is great for additional prep space, or just setting out food for a buffet style meal. Large refrigerator will blow away the smaller "camper" fridges. Stainless Steel appliances. Stocked with towels, plates, pans, utensils, games, and other essentials. Large flat screen TV with DVD player and radio with inside and outside speakers. The outside has a large awning and great outdoor kitchen. Power tongue jack and power stabilizer jacks make set up much less laborious. The bunkhouse is perfect for kids or adults. Towable by most 1/2 ton vehicles. This RV offers an EXTREMELY Functional Floor Plan for everyone. It has the functionality to sleep 9 seamlessly! 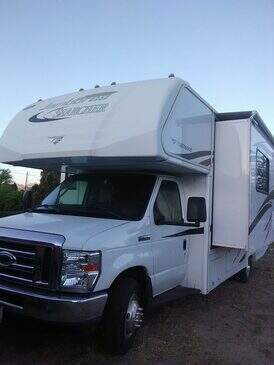 My 2014 Fleetwood Jamboree SearcherRV is known foe excellent quality construction. You'll wish that everything was built like my Jamboree. Enjoy extended season camping and tow your toys along with Jamboree 's big towing capacity. 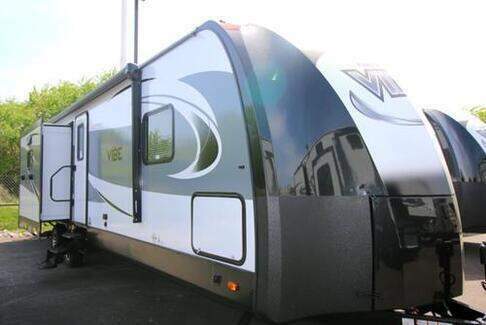 It's also easy to drive reliable beautiful camping and vacation motorhome. It has a new toilet, new reupholstered dining room seats , and it has sound proof interior. It has tile floor and a clean interior. It is a Fleet wood Jamboree Searcher brand which is the top of the line. It is slightly used and it is a convenient living for a family of 6. 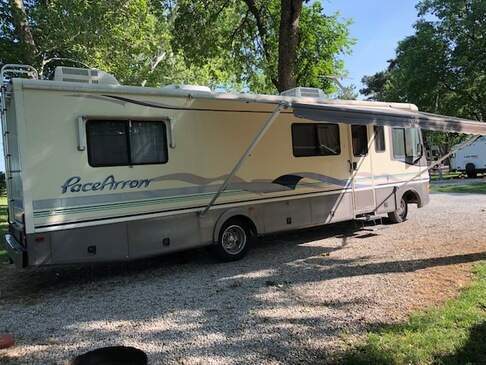 It has the amenities of a newer motorhome that I listed already above like double queen size bed, shower inside and outside , microwave /stove, refrigerator AC/ heater, swivel TV and DVD player, MP3 player, blue tooth connection, iphone connection and much more. Well Maintained and garage kept - Very clean in near new condition. This Pop-up is EASY to set up ad break down so you can enjoy camp quickly. Enjoy this pop-up for local events like NASCAR, Country Thunder or Cochella. 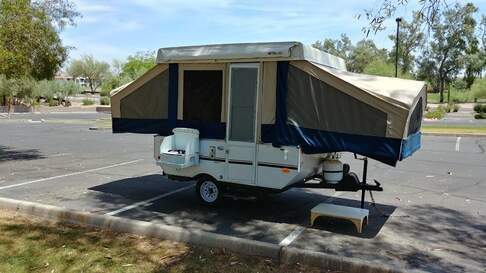 This camper is light weight and easy to pull up the hills to visit Sedona, Payson, Flagstaff and other great camping areas to escape the heat. We look forward to sharing our Pop-up Camper with you for a great trip! has tons of extras: linens in back bedroom, extra blankets, 3 outside chairs, outdoor rug, outside fan, and pinic table cover. Don't let the age fool ya. 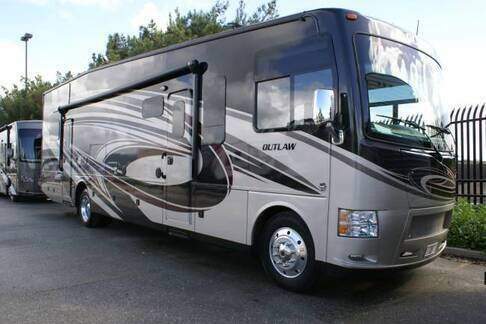 This reliable motorhome has been remodeled with wood floors and flatscreen TVs. This class A motor home has been restored and is one of the nicest deals around. You’ll love the comfort and value it provides. 2 flat screens and all the amenities you need. Great for children, we'd be happy to loan you some things to keep them busy. The updated cabin is well furnished and ready for you to use. Plenty of room for 4 adults and easy to add a few extra children. The "dreamboat" drives great and you're welcome to take take it on a road trip, but we love renting for trips near Omaha. We're even willing to drive to campsites for you and can save you trips to the gas station and dump station. Ask about sleeping accomodations for more. We have air beds, adjustments for children and tents available. Joshua Tree Magic - Luxury Fifth Wheel RV!